With Clerkenwell Design Week kicking off tomorrow, Dezeen's Natashah Hitti picks out six of the best installations to see, including a pop-up street of pink townhouses and a pavilion made from layers of interwoven string. Dezeen is media partner for Clerkenwell Design Week, which is now in its ninth edition. The annual event sees design-focused happenings take place, in an area of London that is home to scores of architecture studios and furniture brands. This years's event runs from 22 to 24 May, with venues including the former prison known as the House of Detention, the Museum of the Order of St John and Fabric nightclub. London-based art and design studio Kinetech Design will be erecting a large kiri-origami structure in St John's Gate, which saw the first performances of some of William Shakespeare's most famous works, including Romeo & Juliet, Hamlet and Macbeth. In a nod to the site's storied history, the installation, titled Royal Approval, has been designed to resemble a giant Elizabethan ruff. According to the UK Environment Agency (UKEA), the ecological footprint of a cotton tote bag is 327 times worse than a regular plastic bag. To address this issue, students from Chelsea College of Art have set up an installation with Print Club London to encourage the reuse of old totes. Visitors can "give new life" to their unwanted totes by taking them to the screen press installation to get them customised with designs created by the students. 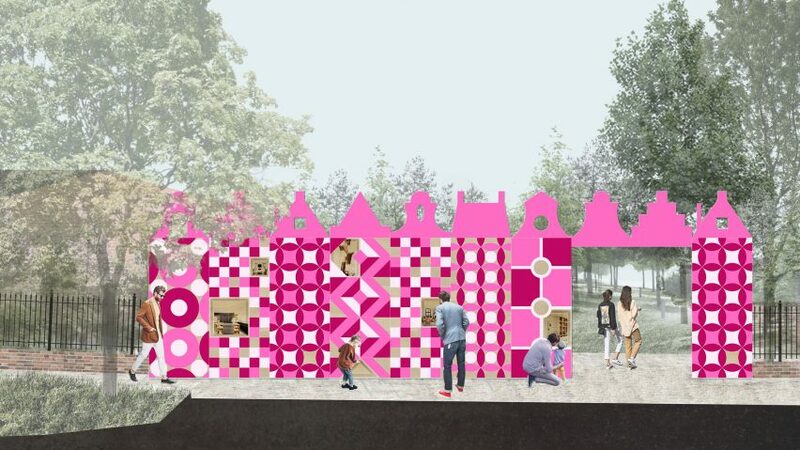 Dutch wood flooring manufacturer Hakwood is teaming with interiors company Shape London to install a three-metre-high pop-up street scene of Dutch townhouses, decorated with pink tiles. Located at the entrance to London's Spa Fields, each of the houses will feature a small door that, when opened, will reveal a series of miniature interiors containing Hakwood flooring. Design Collective Scale Rule returns to Clerkenwell for a third year to assemble a pavilion in St James' churchyard. This year's construction, designed in collaboration with GCSE students from around London, is a response to the topic of sustainability. Made up of layers of interwoven string, designed to represent past, present and future, the creation invites visitors to direct their eyes upwards and observe natural elements around them. Graduate designer Lou Corio Randall will create street furniture in various locations around Clerkenwell, using bent steel tubes. These colourful pieces will include benches and bicycle racks. Also promoting sustainability are London office TDO Architecture, Studio 8Fold and Studio DA, who have each been commissioned to create way-finding structures made of polystyrene. These will be placed around Clerkenwell during the design week. The event's content editor, Max Fraser, explains how, despite being seen as harmful to the environment, polystyrene is actually one of the most sustainable materials, as it is made up of 98 per cent air and can be endlessly recycled. "If the material is sent back to the manufacturer, it is 100 per cent recyclable," explained Fraser. "We are commissioning these beacons at CDW with their end-of-life destination fully diverted from landfill."